BASE casts the iconic shape of a table, as straight forward as a child's drawing. Extruded Aluminum, painted with an acrylic paint. The tables light Scandinavian simplicity makes it the perfect base to build an interior design concept around, with a versatile extruded aluminium frame that makes it suitable for both professional and private environments. 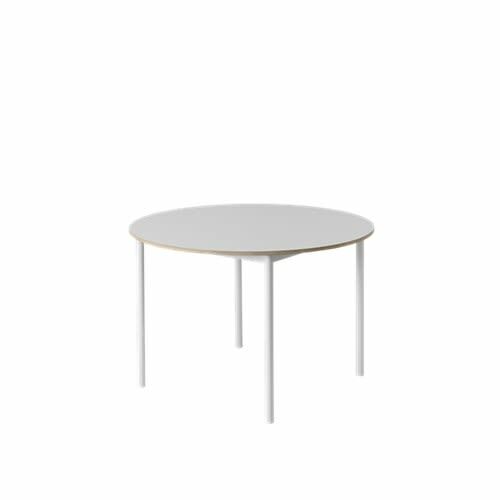 The BASE table has been designed with the maximum level of attention to detail and quality and is produced to withstand continual robust use. Clean the table by wetting a cloth in hot water and a mild mixture of universal detergent or washing-up liquid. Never use strong chemicals. Water and fat may leave stains and should be removed right away. For linoleum versions it is recommended to use a linoleum polish on the surface 2-3 times a year.